Bike sizing is very likely the most important decision you can make before buying a bike - any bike, new or used. Will this bike fit me? Will it work for what I want it to do? Is this the right bike for me? These are key questions you need to ask yourself before buying a bicycle. Knowing what works and what doesn't will help you choose among the bike that fits and the one that never will. It will help you decide if a bike on sale is worth purchasing or not. No matter how good the deal is... a bike that doesn't fit is never a good deal. With the information from bike sizing, you will save you a lot of money and even more aggravation. You'll find the ride of a lifetime. In this article we cover a wide-range of topics to help you make sense of the sizing process and decide if you need it for yourself. Who can benefit from from bike sizing? When sales are not a good deal? How are bicycle designed in sizes? How's the process of bike sizing done? Do I ask the right questions to select the bike that's right for me? Everyone buying a new or used bike should get sized. Knowing the right bike size is the most powerful tool in your purchasing process. It's often given for granted you know your size or someone could tell you just by looking at you. Often, it's expected that a little variation would be OK; you can adjust to the bike if it's a little too big or small. But that's not true. Size matters. To everyone. From the weekend warrior, to the recreational path rider. Right bike size = comfort and performance. Integrated handlebar/stem combo like this one, found on the Scott Foil save on aero drag, but must be sized before you buy the bike. It cannot be adjusted and is expensive to replace. Especially if you are considering a new aero road bike like the Specialized Venge or the Trek Madone 9.x, bike sizing becomes crucial. These new hyper-aerodynamic bikes have highly integrated aero components of fixed size, like the handlebar/stem combo, with no range of adjustability. You need to spec the handlebar, stem size and rise before purchasing the bicycle. This will ensure the right fit. Considering the limited range of adjustability found on these aero bikes and the extreme cost (and wait time) to replace these highly proprietary parts, bike sizing is no longer a question. You must know the size needed or pay the excruciating costs of poor comfort and performance on a bike that is designed for pure bliss - when dialed-in. 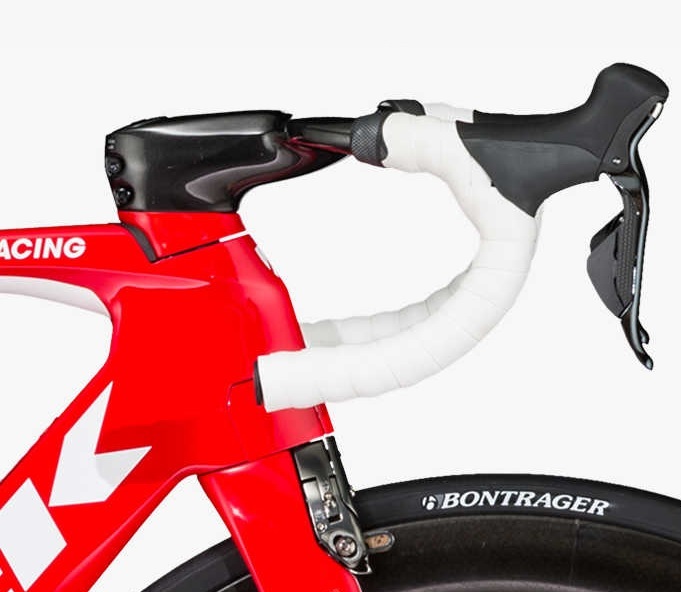 The Specialized Venge uses an integrated stem combo that's proprietary. You must know the size at time of purchase. Triathletes also should consider closely a bike sizing session before purchasing their next Tri aero machine. All bets are off when it comes to Tri bike sizing: you may be a size Small in one brand and a Medium in another and a 56 cm in yet another (more on this further in the article). Once manufacturers split off the UCI Time Trial standards, the designers became free to seek the most aero design with huge implications on the sizing: there are no agreed-upon standards among manufacturers engaged in a race to achieve the most aerodynamic bike ever. Even mountain bikers are now confronted with a vast array of choices that makes sizing more difficult: 26, 27.5, 29, 29+, fatty 26. The wheel size choice drives the geometry and sizing. Mountain bikes are sold first by application, then by size. A Trail bike's geometry is different from its Cross Country brethren and one can never perform the job of the other quite as well. Full suspension versus hard tail is also a consideration for geometry and sizing. Add the option of having suspension forks with different travel range - which has a direct impact on the geometry angles of the bike and its handling- and you have such a range of options, you could shop MTB geometries till the cows come home. If you ride Trail on a Scott Genius, you may ride a Large, but your Niner Jet9 RDO for technical Cross Country maybe a Small and your Jamis Nemesis 27.5 for fast Cross Country may be a Medium. You should be. And that's a good sign. You are engaged and you care about finding the ultimate performance for your bike of choice. WHAT IS BIKE SIZING AND WHY SHOULD I DO IT? Bike sizing is a process during which your ideal size, geometry and components sizing (crank length, handlebar width, seatpost offset, etc.) are determined. 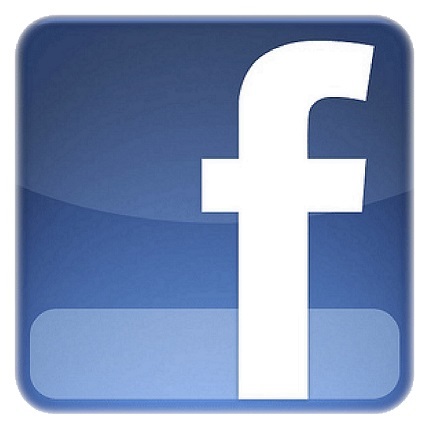 It gives you the information you need to make a targeted decision. With the information from a bike sizing session, you'll know what bike fits you the best, regardless of brand and model, giving you the information needed to shop with confidence. You can compare brands, models and specs to find the bike that fits you right - not the one that's on sale or the shop is pushing you to buy. It takes the uncertainty out of the bike purchasing process and puts the power of in your hands, making you an informed shopper. She is purchasing a new bike. Not sure of her size and best geometry, she sought a bike sizing session. Connected to the Retül wiring, the sizing and fitting process helped find the right bike for her. Bike sizing is done with a funny-looking contraption called a sizing bicycle. The sizing bicycle can emulate any geometry and size. Coupled with the Retül 3D motion capture bike fitting technology, it's a powerful tool to test many different bike parameters (in any combination) to arrive at the ideal set up uniquely fit for you. Bike sizing helps you find the best bicycle size and geometry that fits to your body type and limb characteristics. The length of your bones and the ratio of one set to another is critical to your sizing. It goes a step further. The sizing bike. I can emulate any size, any geometry, any bike type: road, tri, mountain, etc. Bike sizing takes into account the idiosyncrasies in your body to help you chose a bicycle that doesn't conflict with any of your limitations. Your flexibility, joints range of motion, current conditioning at key muscle groups and injuries are taken into account to find a bicycle geometry and size that's appropriate. Your strengths are also taken into consideration, to maximize your talent. Bike sizing taps into your strengths, while protecting your limitations. You have a long torso and shorter legs, your flexibility is marginal (can't touch your toes) and you suffer from back pain. Bike sizing can find the type of geometry you need to be powerful and comfortable without having a mountain of spacers under your stem. Too many spacers weaken the steerer tube of your fork and may fatigue it to failure over a period of time. If you are strong with a developed upper body, or you are a sprinter (even if it's just to the next road sign), a frame with a higher stack would be more suited to you. 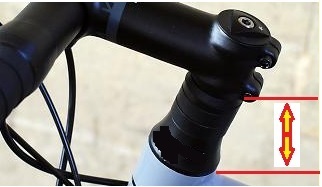 This would reduce the length of the steerer tube exposed and the amount of spacers needed under the stem - making it stronger and safer. With a bike sizing session, the ideal geometry can be found for this special situation - and many others. 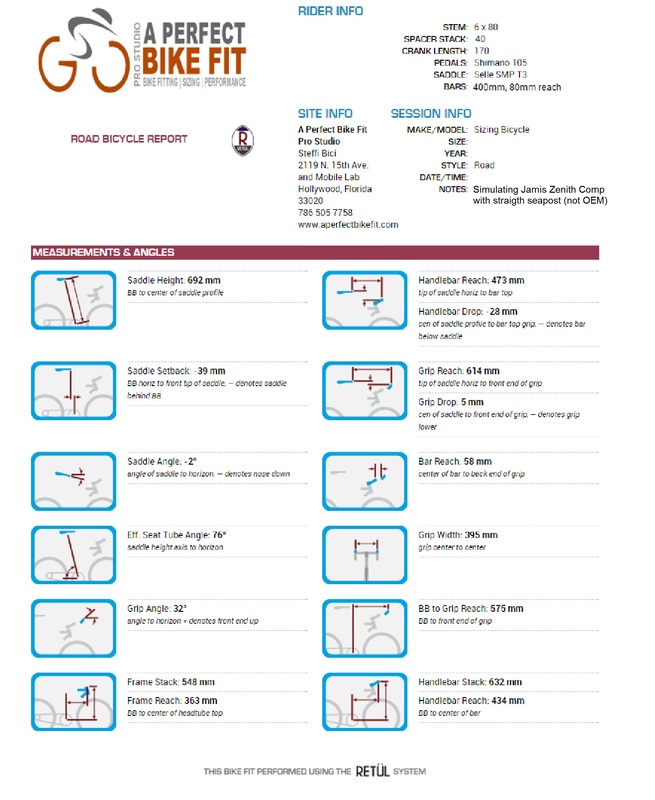 The result of a bike sizing session is a geometry specifications sheet that will allow you to learn everything you need to know to buy a bike with confidence. It will equip you with the information necessary to know your size, geometry and the size for critical components like the width of the handlebar, the size of the cranks (often overlooked) and the need for (or not) an off-set seatpost - all specific to you and your needs. With the new complexities of the bicycle design (thanks to sophisticated CAD systems and nanotechnology), this is vital information. Consumers have been left behind by bicycle manufacturers who go deeper and deeper in a world of ever-increasing sophistication and proprietary customization. Geometry charts have become hard to read. The subtleties in their numbers can mean a big difference between a bike that fits and one that never feels right. Bike sizing done while accounting for your strengths, weaknesses, body ratios, preferences and application will help sift through all the complexities and help you make an educated choice that rewards you with the ride of a lifetime. 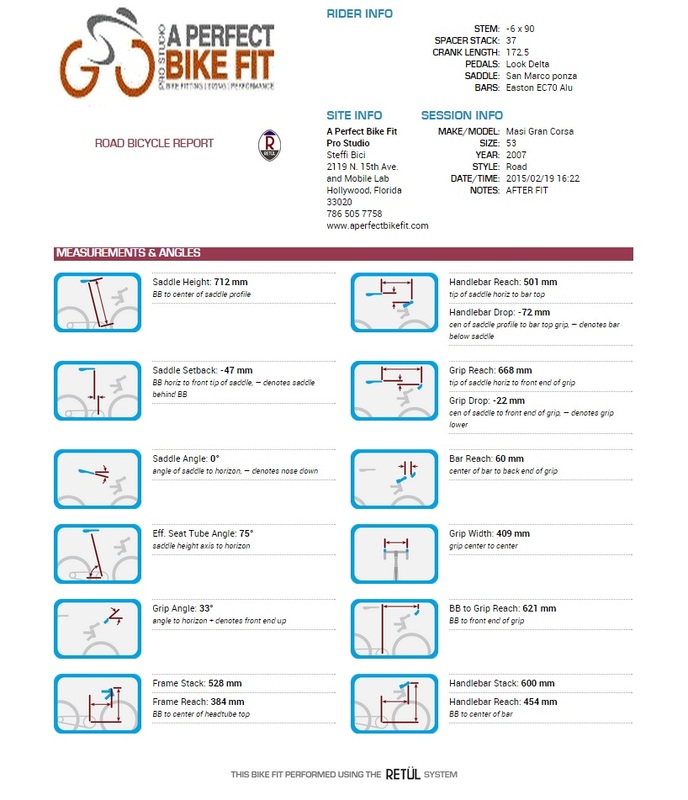 A geometry specification sheet produced after a sizing session for a road bike. This customer chose a Jamis Zenith Comp and wanted to make sure of the size. We found a 0 setback post is needed instead of the OEM setback. It can be swapped out at the bike shop during the purchase. Click to enlarge. Most cyclists think they know their size. At one point of your cycling life, you have been told your size by a shop employee or an expert. "You are a 52". That information stuck and became your sizing identity. You carried that sizing ID with you and it was your guidance through several past purchases. But, suddenly, today, it doesn't apply anymore. The complexity of bike design has increased dramatically in the last few years - making sizing more complex. Long gone are the days of the traditional (AKA standard) geometry sizing, where a 52 cm bike measured exactly 52 cm at the top tube and seat tube. Today, a size 52 cm could be a sloping geometry and have a 55 cm top tube; or could be a compact geometry and have a 53 cm top tube. And some manufacturers still make traditional geometries too, adding to the confusion of sizing. Click the image for full size. May need to use CTRL+mouse scroll to enlarge. Look at the example above. Here we look at a comparison between a 52-53cm size in 3 popular and prestigious brands, each with their interpretation of sizing and geometry. When you look at Colnago's bikes, you see two options: 53 Traditional and 52 Sloping. OK, so that should be just about your size, right? Nope. Look closely. The top tube of a 53 Traditional (measurement O) is 53.7 cm, while it's 55 cm on a 52 Sloping. Big difference. The operative word here is traditional Vs. sloping. Not only the size, but the geometry type are critical to your sizing. 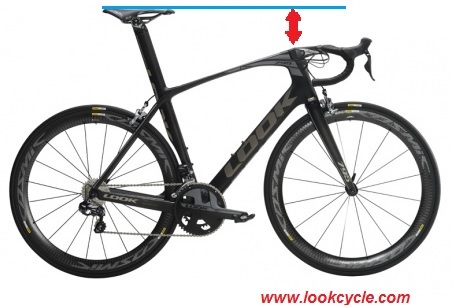 Compare now to Pinarello's sloping geometry. A 53's top tube (measurement L) is 54.5cm. And Giant's top tube is 53.5 cm for a Small in a compact. Now you have learned that the OEM stated size is not the only driving parameter to your sizing, but also the geometry type. We have encountered 3 geometry types just in this example: Traditional, Sloping and Compact. Are there more? You betcha. There are semi-sloping, quasi-compact and near-traditional geometries - just to mention some - and they reflect the design philosophy of a manufacturer. But they hardly ever mentioned in the sizing chart by type, because the sizing chart itself reveals that to you. That's according to the OEM. Does it help you? If you think this is confusing, welcome to club. Most cyclists are. Blame it on the competition among manufacturers. It drives them to design the ultimate bike, making geometry and sizing the hallmark of their performance. It's nightmare for you to figure out, but the ultimate bliss when you ride the perfect bike. Having more choices is never bad. Making the right choice is the big issue here. Get it wrong and it could cost you dearly. That's when bike sizing really pays for itself. To add to the complexity of choosing the right size, there are also considerations due to the sales process. Unfortunately, bike shops will try and sell what they need to move off the floor. Some bike shop employees are biased by their own experience and can't transcend it to suggest something else. They know what they ride (or would like to) and recommend it regardless of your needs and attempts at communicating your expectations. Not all bike shops operate that way. We know and work with many reputable shops that go to great lengths to ensure the customer is getting the right size and geometry. Many send us their customers to have a sizing session with us. Also, not all bikes are hard to size. But it happens. How often do we hear from fellow riders that they were sold the wrong bike? What a nightmare that is, especially if you bought the bike of your dreams! In our bike fitting practice, we have seen our fair share of riders who had the wrong size bike. It's never pleasant to have to give the heart-breaking news. It happens mostly with cyclists who are at the opposite ends of the anthropomorphical extremes: very tall or very short. This means that we see a disproportionate amount of women in the wrong size bike. We talk about it in this women-specific article. Sometimes, it happens with medium-stature riders, who are on the cusp of two geometries. They were encouraged into the wrong one and now they struggle with a good fit and handling. And, often, the cyclist itself is the culprit: couldn't resist the sale, even when the bike shop warned about the sizing being incorrect. The power of the bling was too much. And even if you were not sold the wrong size, you might have the wrong geometry. If you have that nagging feeling that you never feel 100% on your bike, it could be the geometry in combination with the sizing of your components. Sometimes cyclists can be their own worst enemy. Riders can be swayed by a deal too good to pass up, thinking the bike will fit, even if it's not the right size. Don't buy a bike just because of a good deal. It may look good standing; it may have great components. But when you ride it..? Not so good. OEM bikes come with the best combination of sizing, geometry and components sizing that fits the largest average of humans possible. That combo is driven by the 95-percentile human: 5'8" and about 160 lb with specific body ratios. That may work for some people. But definitely not everyone. And most often than not, you know what happens when you try to make everyone happy: no one really is. Add to this the complexities of UCI regulations, limiting certain aspects of a bicycle design. 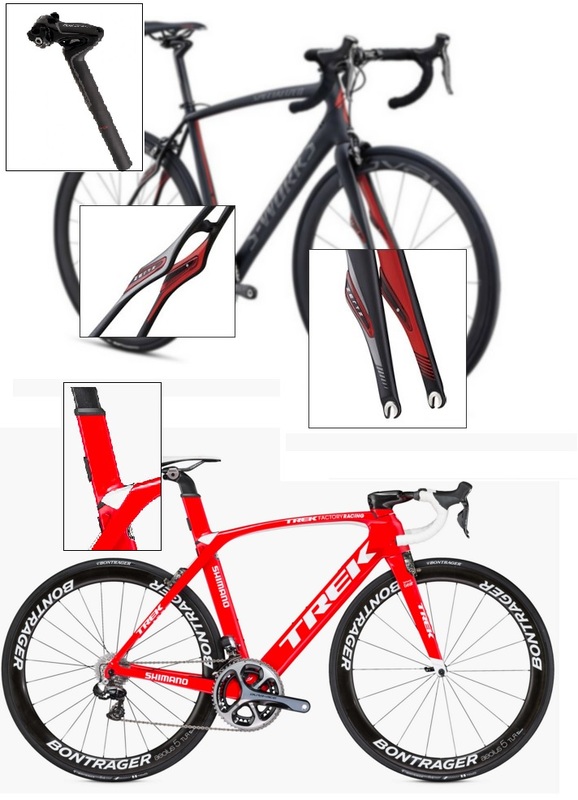 The unintended consequences of UCI rules produced (in this order) a number of bicycle design monstrosities, especially for aero models, followed by more regulations to prevent them, restricting bike design too much, further followed by a clean break between the UCI and the main Triathlon governing bodies, which led to the cowboy days of aero bikes design. 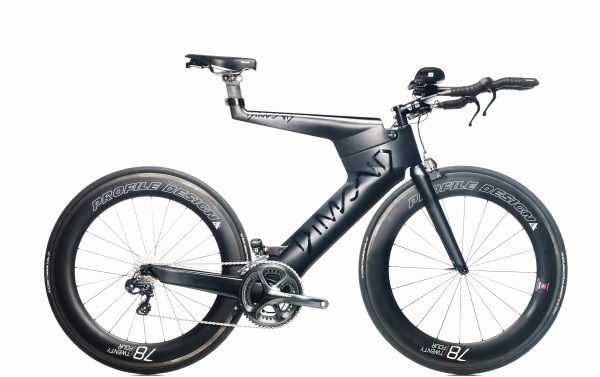 Even though Tri bike design is positively moving in the right direction, as of now, the design variations are so wild, that sizing has become nearly impossible even for the most sophisticated bike shops. Let's look at the geometry chart of a couple of popular aero bike: the Specialized Shiv and the Scott Plasma. When looking at the reach and stack measurements, it becomes obvious that a Small Shiv closely compares to a Medium Plasma. The same goes for the XS Shiv and S Plasma. 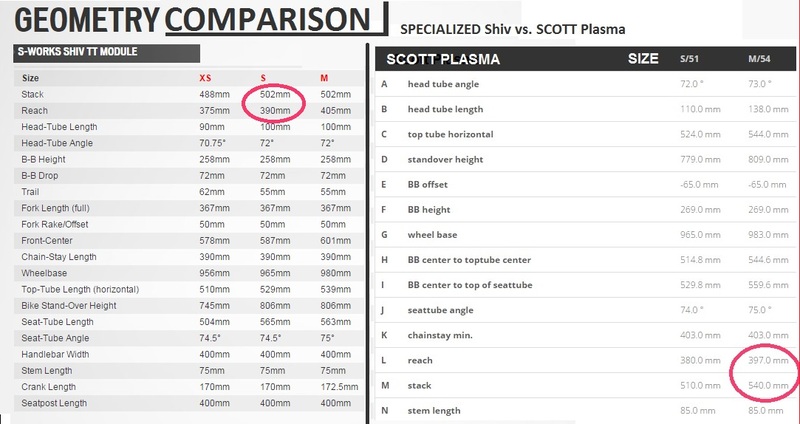 If you were shopping for a bike and you walked first into a Scott dealer, and were told you were a Medium, then you'd go to a Specialized dealer thinking you'd need a Medium. And you'd be wrong. Who would catch that mistake? That's our job. The job of the bike fitter. Do you know what is the right crank length for you? Let me guess, you ride a 172.5 on the road and 175 on the mountain bike. But is it right for you? Crank length is closely related to your femur (the bone in your thighs) and your tibia (the bone in your shins) length and their ratio. But the length of the crank plays a much more intimate dance with the seat tube angle of the bike. A variation of 1 deg at the seat tube causes the seat to move back or forward 15mm on a 52 frame. That's big. 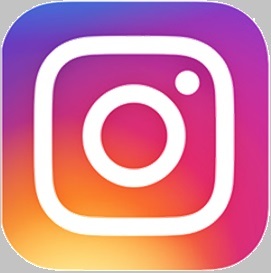 A crank varies in length just 2.5mm (from a 172.5 to a 170 or 175) in either direction. See how a important is this combination? Seat tube angles vary quite widely. You might have heard people saying they like a steep geometry or -the opposite- slack tubes. What does it mean? The angle of the seat tube and head tube influence greatly the riding character of a bike. Steeper bikes (bigger angles at the seat and head tube) tend to be more maneuverable and twitchy (with exceptions) and usually are race-oriented. The opposite is true for slacker bikes, with more relaxed geometries, better suited for endurance and typical amateur riding. For a brief and brilliant explanation of bicycle frame geometry and its effects on riding qualities, read here. As you select one geometry over another, the choice of components, especially the crank length, becomes an integral part of the process. Yet, no one thinks about it or has ever bothered telling you before. The wrong length crank will leave you with the feeling that you can never give it your all, even if fit properly. Bike sizing takes the guess work out of the bike size, geometry and components sizing. Let's look at this again. What is sizing? 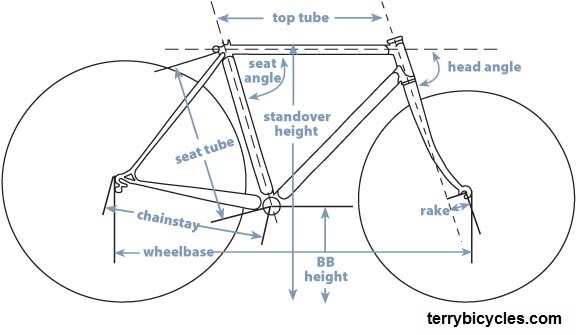 Sizing is the process of being fit into a sizing bicycles to determine the right size, geometry and size of components (like cranks, handlebars, stems and seatposts). It helps you determine the best combination of seat tube angles, crank length, handlebar width, height of the head tube, and so much more. It's done using a sizing bike, a stationary bike that can change shape in every direction imaginable and has variable length cranks. 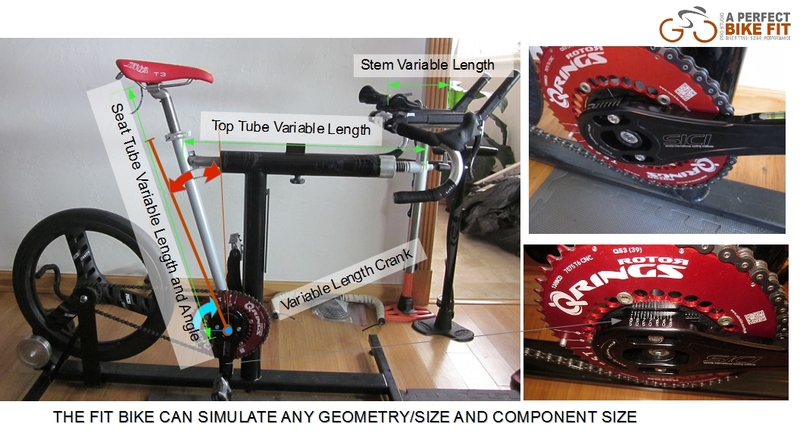 With a fit bike is possible to simulate any geometry and size of any bike. Typically, you'll go to a sizing session with a list of 2-3 bikes you are considering. The geometry of each bike is set up on the sizing bike to OEM specs and individual components are sized. There is also a process where we can start from scratch and just design a bike geometry around you - ideal for custom geometries. You provide information on what you want to the bike to do (or not do) and the application (more on this later) and we work out the set up and test a several options until optimal. A Retül 3D dynamic motion capture bike fit is done to asses how successfully you can integrate with each size/geometry and how well you respond to components' size changes. 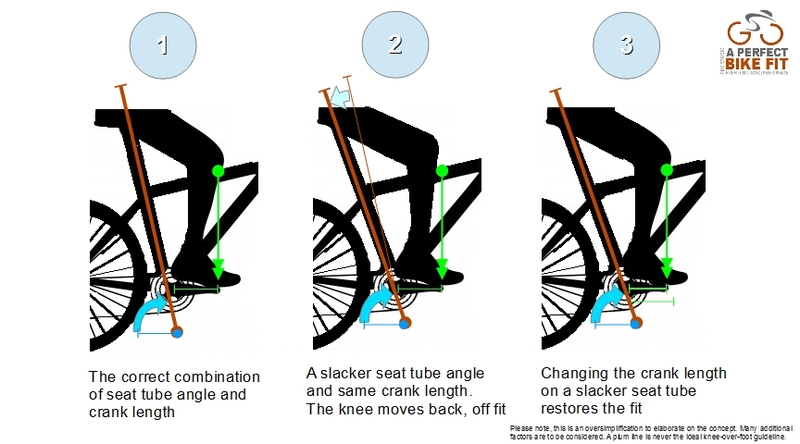 Adjustments to the sizing bike are made: stem length, handlebar height, seat height/fwd/aft are moved until you are in a biomechanically neutral position - just like during a regular bike fit. The best position is sought within the allowable range of each bicycle's specific geometry/size. Most importantly, crank length is tested at this stage. If needed, the length of the crank is changed within your biomechanical range. This is where it's found whether you and the bike are a match or not. 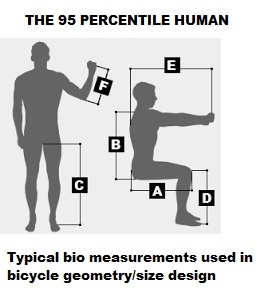 If biomechanics parameters don't line up as they should, it's time to move on to another geometry/size. The geometry spec sheet. The result of Retül's bike digitization process after the fit session. It's unique to Retül, no other fit system uses a digital, 4 lasers, CAD methodology to take the measurements off the bike (in this case the sizing bike). Most (if not all) other bike fitting systems take measurements manually, introducing large human errors. This process is repeated for each bike size/geometry/component spec. Retül's motion data for each capture gives a skilled fitter the information needed to find your optimal settings. A fitter can see when you move in harmony with your equipment. 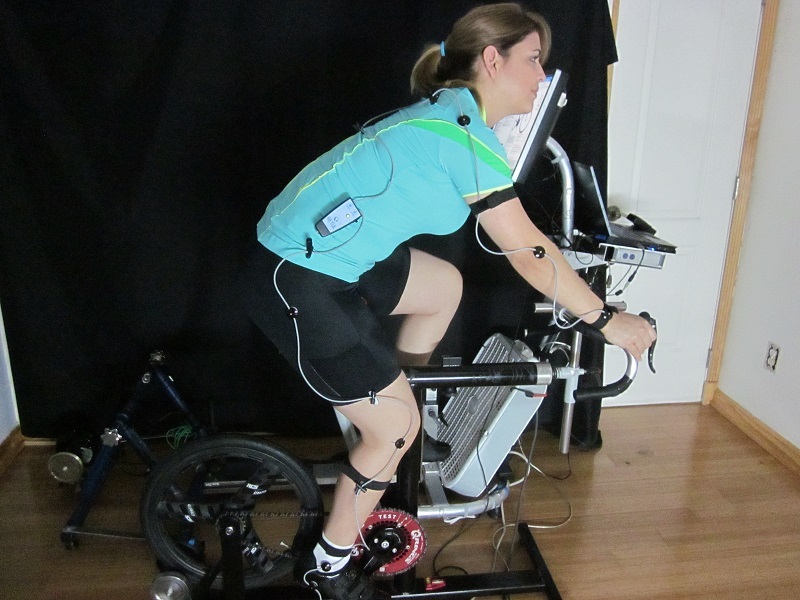 The Retül dynamic motion capture system with 1mm of accuracy helps the fitter tell when subtle-most movements are out of synch and then adjusts the sizing bike. In our practice, we work in a 2-way communication with our cyclists, so changes are made that not only look good on the data screen, but also feel good to you. After we arrive at a sizing bike set up that looks and feels good, we collect the measurements with a system unique to Retül. The final settings on the sizing bike are digitized with a Retül process called Zin. 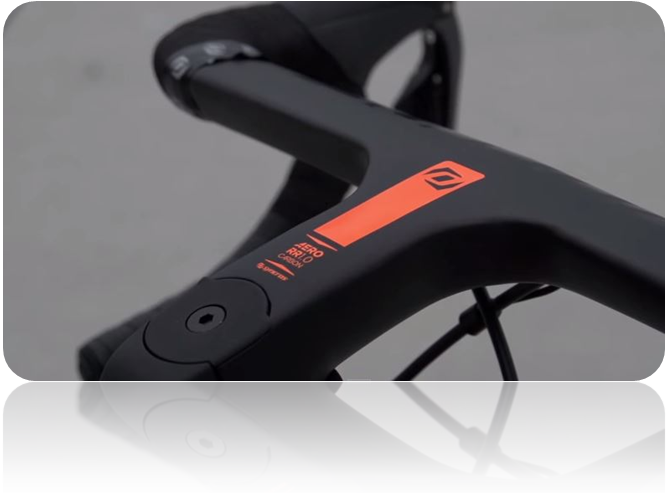 The Zin is a laser 3D CAD wand that traces the bike's components at key locations and records all key measurements on the sizing bike. 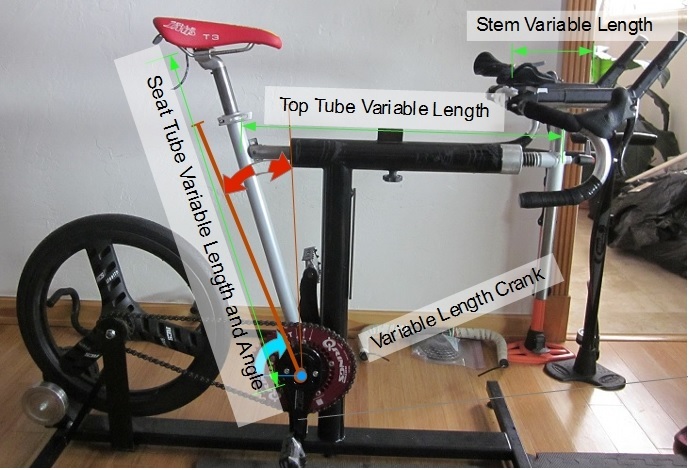 It generates a geometry sheet with loads of information like crank length, handlebar reach, stack and width; the height and setback of the saddle, etc. 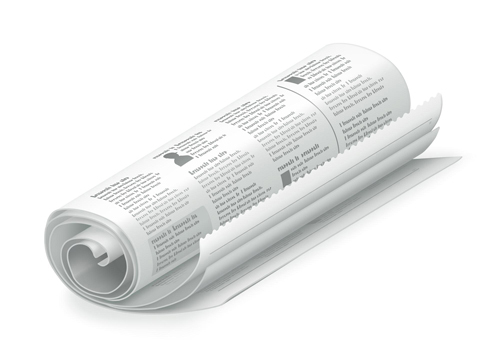 It's a wealth of knowledge that is provided to you in a PDF file you can view on your smart phone. And, more importantly, give us the key measurements by which we can help you select the right bicycle size and geometry and even design a custom geometry specific to you using the Dream Bike software of our own design. Go here to see about custom geometry design. For riders looking to purchase beautiful bikes with integrated components, like the Specialized Venge, Trek Madone, Scott Foil or Look 795, etc. bike sizing is very important because it helps determine the size of the integrated stem/handlebar combo. 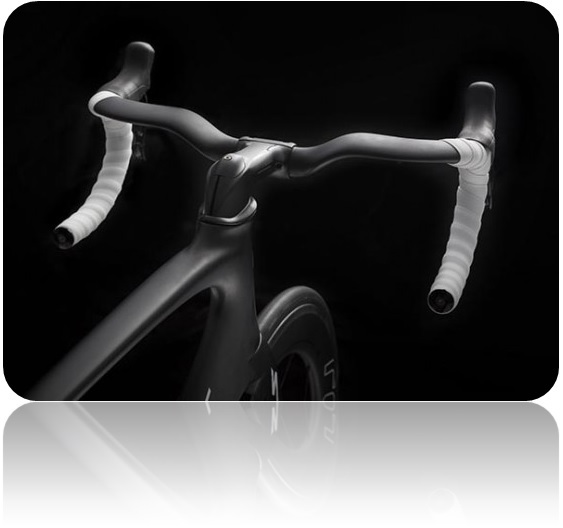 These beautiful and extreme aero components have a major drawback: they cannot be adjusted and are highly proprietary. If you bought a bike with a 100mm 42 cm stem/bar combo (standard stock on sizes 52-56), and you ride it, you are stuck with it, or, you need to spend $1,000s to replace it. Bike sizing will help you find the right handlebar/stem combo size to achieve the right fit. Don't ride out of the store with the stock set up. The bike shop will swap out the parts for the right ones before the final sale. With the information from bike sizing, you'll know exactly what bar/stem combo to ask for. That's what you are looking for in a new bike. It makes you the best informed shopper. And this is were things become interesting. Reach and stack are the only two truly standardized measurement parameters of any bike. They essentially standardize the measurements of how long and how tall the top tube is in comparison to the bottom bracket. It's universal. 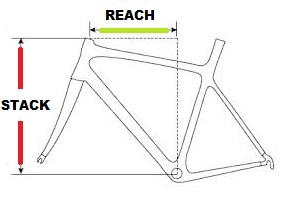 Reach is related to top tube length normalized off the seat tube angle (unlike the top tube length). Stack is related to the height of the head tube - making it a big consideration for cyclists with back issues or Big & Tall and Small & Short riders. Unfortunately, no one ever tells you: you are this reach and this stack. And so, sizing becomes the necessary process to determine these 2 key parameters so you can compare bikes of many different manufacturers. Given 3 parameters, reach, stack and seat tube angle, it's possible to draw a bicycle geometry - with the top tube and standover clearance helping complete the process that drives the purchase. It gets more complicated with handling characteristics driven by head tube angle and fork rake and fork trail, wheel base, etc. But those parameters are decided for you by the manufacturers striking the best balance and are not a variable option for a typical consumer during the off-the-shelf bike buying process - they are, however, during the custom geometry design process. Armed with the information of reach and stack and your ideal crank length for each geometry and integrated components size (bar/stem combos), you can now begin shopping as an educated consumer. You can go to an OEM's web site and custom build the bike of your dreams. You can engage your bike shop in an intelligent conversation that will end up with the best ride of you life. A proper bike sizing session should always be followed by the final fitting on the actual bike you purchase. 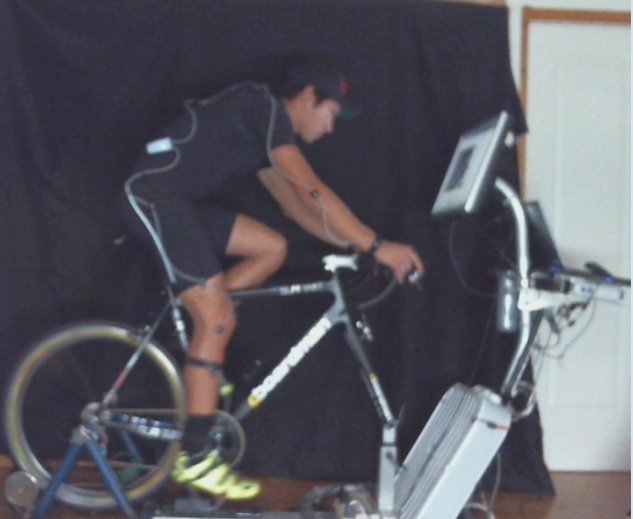 Transferring the measurements from the sizing bike to your new bike is not very effective for most applications. The sizing bike is good at getting you measured up, but it's not great at getting you optimized in your actual bike. Sizing bikes come equipped with a set of customizable parts that do the best at emulating the average component. They are perfect for the sizing process, but not for the optimization needed to do a bike fit into your actual bike. 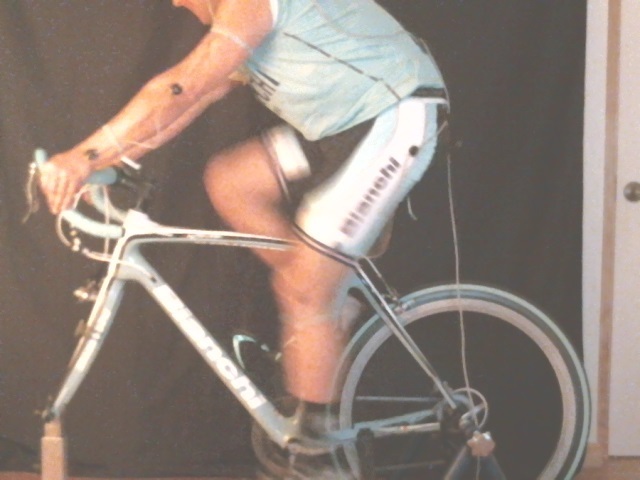 There are a number of nuances that cannot be simulated with the sizing bike. This is the reason why you should avoid getting a bike fit from an establishment that relies only on bike sizing technology for the actual bike fit - that is, it fits you on the sizing bike and transfers the measurements to your bike, never working with you while aboard your actual bicycle. The gap between a sizing fit and a bike fit is very large in term of performance optimization and pain prevention/management/recovery. For example, the Q-Factor (the distance between you L and R foot when clipped in the pedals) varies greatly by crank brand and model. This affects your knee tracking and health. The sizing bike uses a variable length crank that's standard to all sizing bicycles (there is only one made, by Purely Custom). This unique crank is different in Q-Factor from many manufacturers. It wasn't designed for knee tracking alignment, but crank arm length adjustment. The proper position of your cleats to align your knees depends on the Q-Factor. It's important that the final fit is done on your own bike, not the sizing rig, so the knee tracking is aligned to your actual bike. Other nuances are the position and alignment of the shifter hoods/grips, which is paramount for hands comfort. Also, the sweep, reach and drop of the handlebar is vital for the correct wrist and arm position, as well as back comfort. These things cannot be accurately simulated by a sizing bike unless it's an actual clone of your own bike. That means, same handlebars, same crank, same stem, same seatpost, same saddle, same pedals, etc. With so many OEM components variations, no sizing bike can possibly do that. Just stocking all variations of handlebars would be a nightmare. And so, it's not done by any system or anyone. That's when being first sized and then fitted with a process like the one we employ becomes paramount. 1) Day 1: Bike sizing on the studio size bike. Generate geometry sheets. 2) Day 2: Bike fitting on the actual bike. Small nuances make a big difference in the comfort and performance of a rider. This is the process that's proven to produce the most success. Even if you know the right size and right geometry and the size of all your components, one consideration remains to be addressed: the application. Application is what you use the bike for. What do you want your bike to do for you? What are your expectations of its performance in the typical use and its environment? I bet you never asked that question when you went to a bike store. These are the questions you need to ask! You probably assumed that most bikes can do the job with some adjustments - or rely on the bike shop/internet advise to tell you what bike would be right for you. But that's not true. That's an important question to ask: can this bike satisfy my needs? We recently worked with a customer who purchased a very high-end bike for his 50th birthday. "I went to the store and looked for the best bike. I wanted to splurge on myself and buy me something really nice." He walked out of the bike shop with a Pinarello Dogma with carbon wheels and electronic groupset. Indeed. But unfortunately, not the right bike for him. You see, this customer rides 2-3 times a week on mostly pot hole-riddled roads. He is no young punk anymore and his flexibility is not what it used to be. Neither is his belly. He is your typical cyclists who rides for health and fitness. And he likes to go long distance. 60 miles is nothing to him. Is a stiff race bike with even stiffer wheels the right bike for him? Probably not. But when he said: "I want a nice bike." he assumed that nice meant expensive (which the bike shop clued on - can't blame them) and that meant also comfortable and adjustable and the best for his use. A few rides in, his aching back made him realize what had happened. As beautiful as it may be, a high-end race bike may not be the best choice for your riding. Price doesn't often equal comfort. His mistake is not uncommon. And so we see a score of people with high-end race bikes struggling to fit their non-racing bodies in them and hoping for relief after the expenditure of a lifetime. 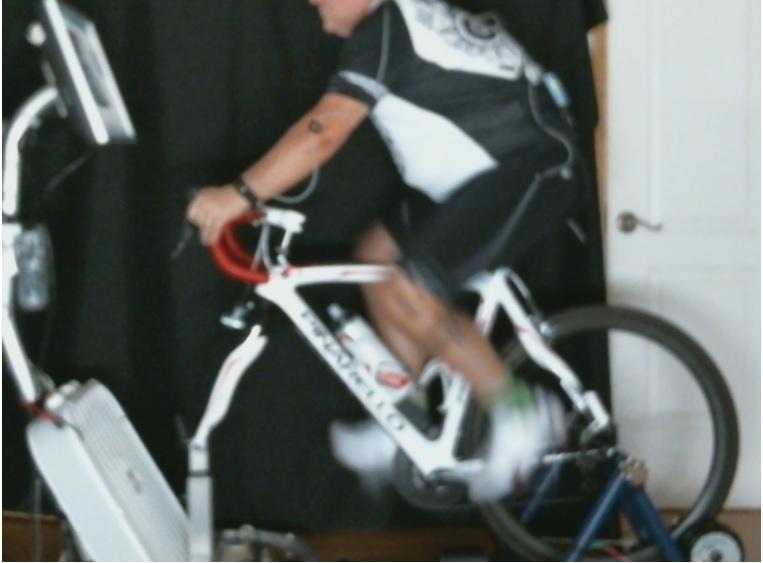 A bike fit can do wonders for comfort. But can't change the riding quality of a bike. A bike sizing session doesn't end at the right size and geometry. It continues with the right bike for the job. And that's why good bike shops send us customers: they want their customers to be satisfied with the shop by helping them buying the right bike. We spend considerable time talking with our customers about their goals in bicycle riding and fitness. We spend a considerable amount of time in studying your body joints, flexibility, range of motion, strength and balance. We talk about injuries and pains experienced in the past or recently in your past and current bikes. This tells us what's possible and what's not. For example, we wouldn't recommend a Look 795 Aerolight for a middle-aged cyclist, with average flexibility, who likes to ride with the weekend group for health, fitness and fun. The Look 795 has a very low stack (i.e. very low head tube) and an aero stem integrated in the top tube with very little range for rise. This may be the perfect bike for a hyper-flexible, young racer; but hell-on-wheels for a baby boomer. The fun part of riding would fly right out of the window for the cyclist in our example. Eventually the health and fitness would too, as back pain sets in. Not because this is a bad bicycle. On the contrary. It's a great bicycle at what it does: beautiful, slick and race-oriented. But not the right bicycle for our fictitious, cyclist in this example. Beautiful, slick, elegant. This is a race rig. Awesome at its job. But not the bike for a baby boomer. Bike sizing studies you in your application and helps you choose not just the right geometry and size, but the right bike. Even with a good bike fit result as seen here, this cyclist struggled with the stiff riding characteristics of a nice Bianchi Infinito C2C. IS CARBON ALL THERE IS? Most bikes these days are carbon. Carbon bikes are wonderful. Light, elegant, complex in shapes... Masterfully designed on CAD systems and expertly executed with nano technology that aligns just the right amount of molecules in the right place. There are so many variations of carbon with different characteristics of stiffness and compliance. But because of the expensive manufacturing of carbon (due to complex moulds and large vacuum autoclaves) there are fewer options in the choice of geometry. So, most carbon bikes are race oriented, with small variations from what the Pros ride. There are exceptions, true. But the lay of the land in carbon bikes has a strong racing pedigree. This makes the question of application even more relevant. A race bike - an nice, expensive bike - is a stiff rig, designed for speed but not comfort. Some fondo carbon bikes are designed for endurance. They use more compliant carbon and even have vibration absorption dampening inserts to aid with reducing vibration transfer from the terrain. Specialized uses Zertz inserts at several key locations. Trek introduced dampening modules in its Madone line at the junction of the seatpost and top tube. They are a strong attempt at improving the riding qualities of carbon bike and bringing comfort to a material designed for strength. But the truth remains, most carbon bikes tend to have a harsh, stiff ride quality, not well suited to aging cyclists trying to increase mileage for cardiovascular health. That's why we are seeing a return of metallurgy in cycling. Steel and Titanium are making a roaring comeback because they are more forgiving materials and can address the comfort of our ever-growing middle-aged cycling community. Steel is real. And rides like no other material. The warmth, the comfort, the smoothness... Buttery. That's how some would describe the riding quality of steel. Many of us remember that from the old days when steel was the only option. There is a weight penalty; sure. But if you are not trying to set a new land speed record, I'd think that your comfort would be more important. Ti is light and beautiful and very forgiving in its vibrations transfer. You can build a light weight bike that's comfortable to ride. These materials fell out of favor when carbon pushed the limits in frame weight and design. But they are coming back because their riding qualities and durability can stand the test of time. Do you know if you could be a good candidate for a Ti or Steel bike? Is your application more suited for a metal or carbon bike? Would a custom geometry be an option appealing to you? What's your application? Because a reputable bike fitting/sizing studio like ours is not invested in the sale, a bike sizing session could be the best unbiased advise you could ever get. And maybe - just maybe- it will open your world to a new set of choices; ones you didn't think about; the right options for you. Don't make a big purchase mistake. Get sized. About the author: Steffi is a senior fitter with a long history in cycling. She has worked for Colnago as US Director of Sales and Marketing, wrote for sports magazines such as "The Racing Post", "Miami Sports Magazine" and Activate Outdoor Sports Magazine". Steffi has raced with much success with an International UCI Pro license in road and mountain biking. Cross and Triathlon racing followed, not a Pro level, but with more success. Considered an advanced fitter with a propensity for troubleshooting, she has built her reputation as the go-to person for bike fitting. 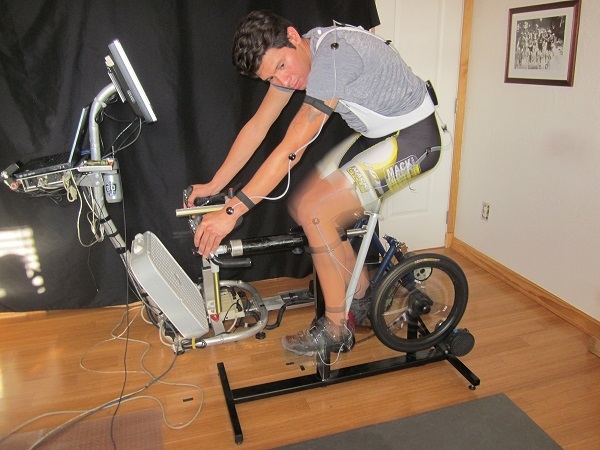 Retül certification and a degree in Aerospace Engineering seem to be the right combination for her to understand the complex relationship between cycling biomechanics, aerodynamics and injury prevention/recovery. A deep understanding of people's behavior and coaching adds a layer of inter-personal connectivity skills that makes her fun to be around and completely understood in your cycling life hurdles. Never afraid of blazing her own trail, she has had several breakthroughs in bike fitting coming from her active mind and constant research outside the box. Steffi established her own business, A Perfect Bike Fit Pro Studio in June 2010 after over a decade of bike fitting research, experimentations and success with customers winning local races and state championships as far back as 2001.